I'm not sure what is going on in this photo. 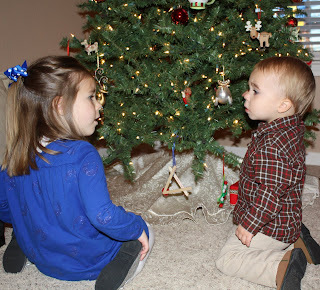 they are trying to figure out why there aren't any gifts under the tree yet. Layla is telling Hayden to ask Santa for a jeep, but he can' t talk, so probably not that either. they are doing I had to grab my camera and take a picture of these two kids! I love them more than I can express! That is too cute! Kids at this age are so funny, when I use to work Mothers Day Out I heard some of the darndest things. Great job on "catching the moment"
They look very much into their conversation. I feel the same way about my kiddos. What an adorable moment to capture! So sweet. Hayden looks totally interested in what Layla is saying. They definitely look deep in conversation! cute! Regardless of what they are talking about, they are just way too precious for words!! love it!! How cute! I glad you grabbed your camera in time to catch that moment!